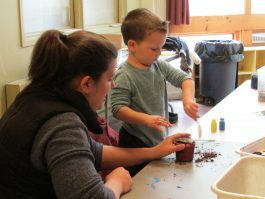 Each week we’ll learn fun nature facts, create crafts and meet exciting animals. Six-week series fee: members $60, non-members $80. Single class fee: members $12/class, non-members $16/class. Pre-registration required. Click here to register for the full series or call 203-259-6305 ext. 109. For individual classes, please call 203-259-6305 ext. 109. Nature Nursery is held at the Center at Fairfield, 2325 Burr Street. February 26 online registration click here.